The Hound Dog garden tiller will soon become a favorite among your gardening tools. It easily turns soil allowing air, water and fertilizer to penetrate the ground resulting in a healthy garden! And with the loose soil, planting is quick and easy! 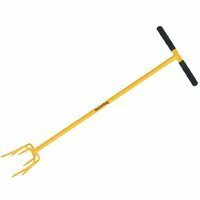 The garden tiller also lessens strain on your back since it is used from a standing position.